Everest Poker are veterans of the online poker scene having got their foothold in the market by being the first true multi-lingual poker site, offering fully-translated software in 15 languages. They are owned by Everest Gaming (Gibraltar) Ltd and are licensed in Gibraltar. Their software is independently tested by renowned auditing firm Technical Systems Testing (TST) who regularly audit the Everest Poker software for fairness and randomness of the deal. Everest Poker used to be one of the busiest sites online, but since the French government decided to ring fence all of the French players, traffic is down significantly, but there are still plenty of good games running all week. 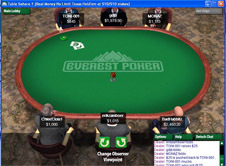 Everest Poker takes an ‘if it’s not broke, don’t fix it’ approach to their software. So much so in fact that there haven’t been any significant updates to it in 5 years or more. It is simplistic and extremely stable and although most new players take a dislike to it, once you have played a few hands there, you’ll begin to appreciate the simplicity. This is particularly true if you’re a multi-tabler playing several tournaments or cash games at once. The tables are re-sizable and the contrast is great, particularly if you use the four colour deck. On the down side, the lack of updates means that Everest is missing some of the nice new features that have become commonplace at other sites like auto-rebuy for ring games and synchronised breaks for tournaments. In keeping with its lack of software updates, Everest are yet to develop software which will run on Mac, Linux or other operating systems. There isn’t an instant play, in-browser option either, which would provide something of a workaround for non-Windows computers. Neither have they hinted that they have any plans to develop a mobile app for iOS or Android platforms. So for now and the foreseeable future, it’s Windows only if you want to play at Everest Poker. Everest are pretty generous when it comes to incentives to get new players to sign up. They offer a $500 signup bonus for any deposit, as opposed to the conventional 100% match that most sites offer. On top of this they give new players a $10 free no-deposit bonus when they create an account, as well as entries to freerolls with a combined prize pool of $30,000. When it comes to clearing your deposit bonus, you get $6 for every 100 Summit Points that you earn through real money play. You earn Summit Points at the rate of 8 Points per $1 in tournament entry fees and 1.4 per $1 of rake taken at shorthanded tables. There are two happy hours each day where you can earn double the usual amount of Summit Points. These occur at 3 PM and 11 PM GMT. Players at Everest are automatically enrolled in the VIP Summit Club, which allows you to get cash back on all of the Summit Points you earn up to a maximum of $5,000 per month. You can also spend your Summit Points in the online store, where you’ll get good value on books and electronics as well as Everest Poker tournament tokens. Everest have a $10 minimum deposit and they accept all major credit cards, as well as Skrill, Neteller, Entropay, and PaySafeCards. If you want to make a withdrawal you can do so to most credit cards, but Mastercard can sometimes be a problem. You can also withdraw using Neteller, Skrill or Click2Pay and withdrawals usually take one business day. Another option is to withdraw by cheque but this method can take up to 6 weeks for you to receive your funds. As mentioned, Everest Poker split in two when French gaming regulations stipulated that French players were only allowed to play on sites based in France. Everest mostly targeted France with their marketing and as such about 50% of their player base was French, meaning the traffic at the old Everest Poker was cut in half. Nonetheless it still gets about 1,500 players at the cash games at peak times but drops off significantly in the middle of the night European time. In the evening, you’ll generally get five or tables running at stakes of $2/$4 with the lower stakes much better served. $0.25/$0.50 will even have eight tables or more running on weekday afternoons. 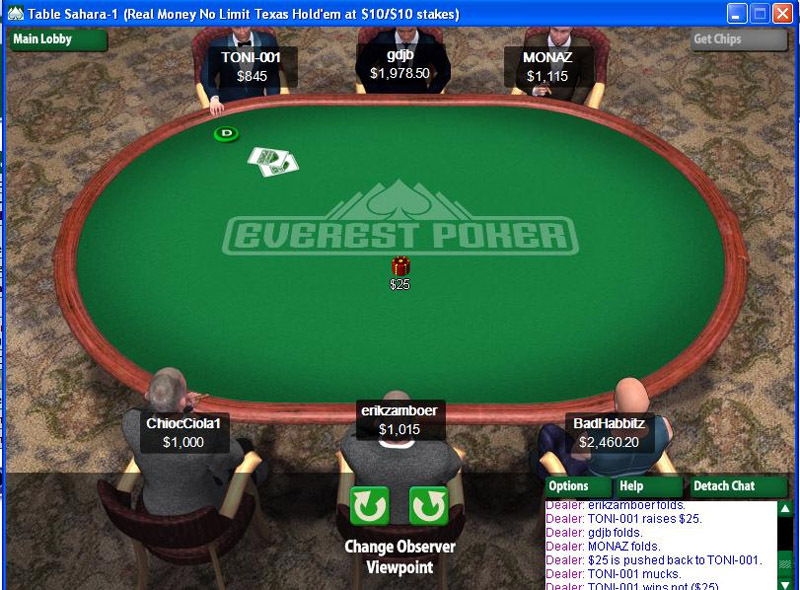 Pot Limit Omaha has similar action, but it rarely runs above $0.50/$1. There are no Stud games or other uncommon variants offered at Everest Poker. The standard of cash game player is very low at Everest Poker. When all of the French players left, most of the regular, professional players also gave up leaving mostly recreational players at the Everest Poker tables. There are guaranteed prize pool tournaments running all week long, and the highlight of the tournament calendar at Everest is The Big Prime tournament which runs at 18:00 GMT every Sunday. The prize pool varies but the guarantee is usually set at either $15,000 or $30,000 with a $100 buy-in. Once one of the busiest European poker sites online, things are a bit quieter nowadays at Everest Poker, but the games are still as soft as ever. If you’re a player who likes to just play 1 or 2 cash game tables or tournament at a time, then Everest is a good place for you. The wide range of language options available means that Everest Poker captures players from all over the world, many of them not from countries that you would consider poker strongholds. Though the software is basic and it takes some getting used to, most regular players at Everest report that they are very happy with it’s stability and usability overall. Small room with a weak players. $500 deposit bonus that clears fast. Cool products in VIP store.